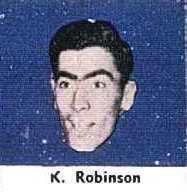 Robinson was at Carlton for 2 years, after crossing from Melbourne where he played 18 games over a two year period, in 1951 and later in 1954. Beginning in Guernsey No. 18 in Season 1955, Robinson only played senior footy in 1956 in Guernsey No. 6, when he managed 2 senior games. He was originally recruited from Ormond. Robinson was Vice Captain of Carlton's 1948 and 1949 Under 19's premiership teams. Robinson passed away on the 11th May, 2002 aged 71. Contributors to this page: Bombasheldon , pblue , tmd1 , true_blue24 , dgreen2 , molsey and admin . Page last modified on Saturday 01 of June, 2013 22:08:31 AEST by Bombasheldon.